Bunches of years ago, Charlie and I drove down to San Antonio, Texas, stayed a few days, and drove back. Since he hates traveling, it was probably a once-in-a-lifetime experience, and we enjoyed the heck out of it. Here are some of the dooriest pictures I took of the missions we visited. Arches count as doors, even if they’re part of a second floor that’s gone, now. There used to be doors. 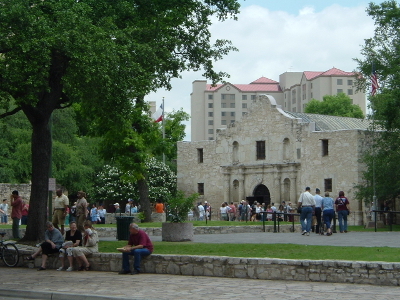 Did you know The Alamo is now right smack dab in the middle of downtown San Antonio? Looked pretty damned incongruous, lemme tell you! 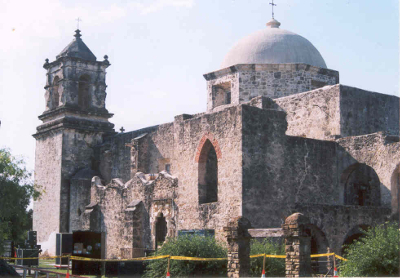 To learn the history of the missions, visit the Missions Of San Antonio site, with plenty of great pictures. This is part of Norm Frampton’s Thursday Doors link-up. Pop on over to his site, click on the little linky-link at the bottom, and see who else is finding doors and where they’re finding them. A WRITING PROMPT FOR YOU: A character goes on a road trip. Jane, I’m looking at YOU. This entry was posted in Throwback Thursday, Thursday Doors. Tagged missions, San Antonio. I did know that, but I still enjoyed this post. It’s weird that I can see this post on my cellphone but my MacBook gets a 404. Things are going to be wonky for a while. I’m trying to transfer from one site host to another, and it’s being difficult. Right now, I’m on the old host again, then I’ll be down while the transfer happens. Learning curves. Why’d it have to be learning curves? I think it needs to be a romp along the way to a serious purpose, with a bombshell in it just for Callie. Like maybe somebody says something indicating, like, “Here we are, doing this thing, I broke a date to come along, always anything for you. Why?” Much laughter. Then Callie wonders if she’s been doing a low-grade, constant Push on her friends for years? Are they really her friends, or does she just want them to be her friends, and does she want it so hard she’s been unconsciously forcing it to happen? Because she needs more to worry about, right? My dear friend! You are a GODDESS at the scrivener’s craft! Perfect spot (Book 3), perfect kick to punch up that sucky ol’ dreary opening! And there I was, trying to just throw in a bunch of werewolves for spice!